Air to water heat-pumps are fast becoming the “go to” way of heating your home. 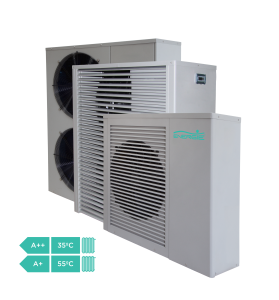 Air to water heat-pumps absorb heat from outside air and transfer this energy to domestic hot water supplies, hot water-filled radiators and underfloor heating. As air contains heat even when it is at sub-zero temperatures, this form of heating system is perfect for use in Ireland’s relatively moderate climate and will provide you with an abundant source of heat all year long. Air to water heat-pumps are a cost-effective and energy efficient heating solution for all homes, but are preferential in homes where underfloor heating or low temperature radiators are installed. Your system will work most *efficiently with one of these heating emitters and should be paired with state of the art heating controls to get the best out of your system. *The efficiency of an air to water heat-pump is gauged on what is called a COP (Coefficient of Performance) Industry standard COP’s sit at about 4, which means that for every unit of electricity you put into the heat-pump, you get 4 in return (1 paid for and 3 for free). It should be noted however that this efficiency rating, or COP is tested heating water from 30-35°C and average ambient air temperature of 7°C. This means that if we are trying to heat water to 55°C or 65°C for radiators, the COP may be far lower. Air to water heat-pump installations will vary from house to house. Installations in a new build home can be more straightforward as everything is more accessible from the start. This does not mean that installation is not viable in an existing home, but a number of pre-qualifiers will always need to be established. Air to water heat-pumps do not require the same installation effort as other heating systems. For example, installing a ground source heat pump requires geothermal drilling, whereas air to water heat-pumps are simply connected to an indoor heating system via insulated pipes.